When they need to cut costs, producers will occasionally re-use and recycle props that were used in other films. Here are 10 that keep turning up in movie after movie. During The Hulk's battle with Thor on the helicarrier in The Avengers, Thor smashed the Hulk into the same Harrier Jet that was used in the climax of True Lies. Joss Whedon revealed this tidbit on The Avengers' special edition Blu-ray. Dr. Egon Spengler's P.K.E. (Psycho-Kinetic Energy) meter from the original Ghostbusters was re-used in various movies, including They Live and Suburban Commando. While Spengler used the prop device to find ghosts, the P.K.E. meter was used in They Live to track alien life and in Suburban Commando to find a freeze laser. Twenty years after it appeared in Raiders of the Lost Ark, the iconic golden idol that Indiana Jones tried to steal at the beginning of the film was re-used in The Majestic. It was part of the fictional in-film Sand Pirates of the Sahara, which is actually an homage to Indiana Jones. The golden idol also appeared briefly in Spy Kids 2: Island of Lost Dreams. The orbital office complex from Star Trek: The Motion Picture is the same miniature used for the Regula One station from Star Trek II: The Wrath of Khan, just turned upside down. The prop was also re-dressed and re-purposed for Star Trek: The Next Generation, Deep Space Nine, and Voyager. Devon Aoki's character in Sin City, Miho, used two samurai swords that the character O-Ren Ishii also used in Kill Bill. In the Sin City special edition DVD, co-creators Frank Miller and Robert Rodriguez admitted that in the film's mythology, fictional sword-maker Hattori Hanzo fashioned both katana blades for Kill Bill and Sin City. At the end of filming Blade Runner, director Ridley Scott wanted all of the prop vehicles destroyed so that no other movie production could use them in the future. However, the Spinner, the flying police car, wasn't destroyed—in fact, it was re-painted and re-purposed for Back To The Future Part II. Blade Runner's automotive concept designer Gene Winfield, who designed the Spinner, also worked on Back To The Future Part II to give the sequel a futuristic look and feel. 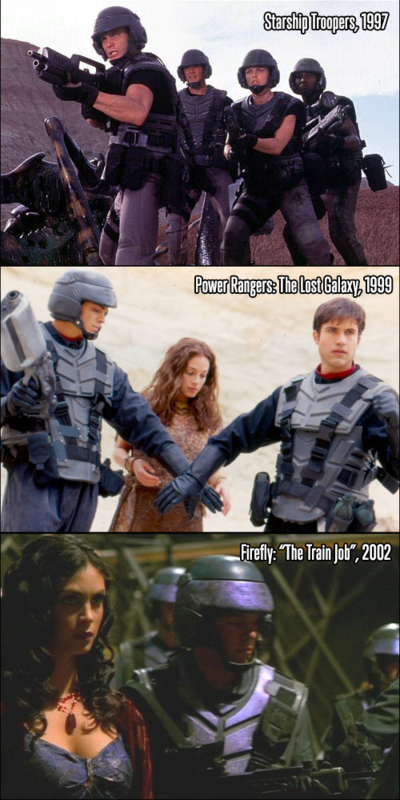 Most of the military gear made for Starship Troopers was re-painted and re-used for a number of other productions, including the television show Firefly—Joss Whedon recycled Starship Troopers' Federation body armor for Alliance soldiers' uniforms—and the 2001 Planet of the Apes remake (director Tim Burton re-purposed Federation helmets for the ape SWAT team at the end of film). California no longer issues license plates in the "GAT" series, so movie productions keep using the plate because it's not tied to an actual identity or car. According to Curb Your Enthusiasm producer Bob Weide, "They're just prop plates that are used by a number of productions. The DMV puts certain number/letter combinations aside for this purpose. Any time you see a readable license plate in our show, it's a prop—slapped on the car by our propmaster." Over the years, the "2GAT123" California license plate became as ubiquitous as the "555" phone number prefix, which is used for similar reasons, in movies and television. For years, the same prop newspaper was used for a variety of movies and TV shows with the same recycled headlines and feature images. It featured a black-and-white photo of a woman with long thick hair and headlines that read, "She's 3rd Brightest But Hard 'Gal' To See" and "Compromised Housing Bill Sent to President for OK." According to Slate, the newspaper is from a small prop company in Sun Valley, California called the Earl Hays Press and was first printed in the 1960s. Movie and TV productions keep using the same prop newspaper because it's actually cheaper to pay $15 per prop than get legal clearance from an up-to-date New York Times or other real-life newspaper.